Phillips 66 appealed the San Luis Obispo County Planning Commission’s denial of its rail spur project to the county Board of Supervisors on Wednesday, the last day the company could challenge the commission’s denial. In its request, Phillips 66 is asking supervisors to put aside the appeal while they seek a court ruling on the process county staff used to designate an environmentally sensitive habitat area. Phillips 66 expects that if a judge rules that the county misapplied land-use rules, the issue will be kicked back to the planning commission. Phillips 66 is seeking approval to build a rail spur so that crude oil currently delivered by pipeline can be transported to the Nipomo Mesa refinery by train. On April 5, after more than eight months of hearings, the San Luis Obispo County Planning Commission voted 3-2 to deny the controversial project. Commissioners Don Campbell and Jim Harrison dissented. Commissioners Jim Irving, Eric Meyer and Ken Topping voted against the proposed rail spur project noting safety concerns and the wide spread opposition to the project. 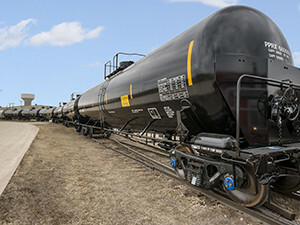 Commissioners Harrison and Campbell argued that there are already trains transporting oil through the county, and that the Phillips 66 project would have a minor impact on the number of trains traversing the area. Phillips 66 officials said oil production is decreasing in California, and the rail spur would allow the company to bring in crude oil from new suppliers. Company officials said, if the county rejects the rail spur, Phillips 66 will deliver the additional oil by truck. If the Phillips 66 proposal is not sent back to the planning commission, the San Luis Obispo County Board of Supervisors will vote on the project, most likely in early 2017. If there is to be a law suit, I believe the public process has to be exhausted first. Why not talk about 3rd party inspection of the rail system and focus on safety not public displays for the illusion of control. Since Phillips 66 will be shipping their oil by dual tanker trucks if this appeal is overturned, which is drastically more dangerous than by the safer train route, and since the Mesa Refinery Watch Group is so concerned about the safety of SLO County residents pertaining to shipping oil through the area, we can preclude that a new yard sign will be given out once again. Lets see if they turn themselves into blatant and unadulterated hypocrites if they don’t produce this newer sign for the safety of all! At the Paso Council meeting last week, Councilmember Strong asked the assembled audience of about 20-30 anti rail spur speakers if anyone in the audience had written to their US Senator or Congressman (Capps) about the Rail Safety Act of 2015 SB 859. Not one person raised their had. Lots of local doomsaying, but no action at the national level to increase train safety. I guess all politics is local. One good comment by an anti….inspect one of the old bridges over Pine Street in south Paso…Thanks for pointing that out! I’ve heard the city has already taken your advice and talked with Union Pacific. Ted Slanders is right. More crude will be going thru by truck, but probably not from the Bakkens as that is going to the east coast according my source. Right now the San Ardo Chevron oil is going to Bakersfield by truck (check out the left turn lane at 46 and 24th in Paso) and the Exxon/Mobile oil is going to Torrance by rail a couple times a week. The Canadians are supposedly mixing something to make their tar sands oil less volatile. That oil will head south. So if the market changes and more oil comes down to the SoCal refineries it does seem possible that Bakken or Canadian oil trains will still come through, but just not stop at Nipomo. Not this again! Okay, the main player in this oil tank train scenario is the “Mesa Refinery Watch Group,” whose web site is full of misinformation, lack of actual facts, and comical errors to sway their followers! When stated by two members of the SLO Planning Commission that the Union Pacific trains are already shipping oil through our area from San Ardo, and on other freight trains that run through are area, Martin Akel of the aforementioned watch group stated that if these additional oil trains in question are allowed, then that only increases the chances of a derailment! Then using Mr. Akels weak analogy, it will take 150 individual dual oil tanker trucks driving on US Highway 101 everyday of the week to equal one oil train per day. Doing the simple math, this blatant FACT increases a crash dramatically, especially since the oil tanker trucks can do 55mph, whereas the oil trains can only do 40mph through urban areas. Therefore, for the safety of San Luis Obispo County, and to be true to form, we preclude that the Mesa Refinery Watch Group will now have new yard signs printed that will be placed in all yards of all homes along highway 101. Logic 101. Additionally, for the safety of everyone, the “Mesa Refinery Watch Group,” will rally their troops once again to propose a run-away truck ramp at the end of the Cuesta Grade for the possible event of a dual tanker oil truck loosing it’s brakes in any way, because like they’ve said, safety of SLO County residents is their main concern! Additionally, so the “Mesa Refinery Watch Group” will not be hypocritical to their concerns for the safety of SLO County residents, they will obviously bring forth initiatives to the SLO Planning Commission to STOP all hazardous materials being transported by rail and truck through are area by using the analogy that more hazardous material being shipped through SLO County, increases the chance of a drastic situation from happening. These include the following hazardous materials; Anhydrous Ammonia, Liquefied Petroleum Gas, Ethylene Oxide, Sulfur Dioxide, Vinyl Chloride, Anhydrous Hydrofluoric Acid, Anhydrous Ammonia Metallic Sodium Chlorine, Liquefied Hydrocarbon Gas, Motor Fuel Anti-Knock Compound Vinyl Chloride, Fertilizer Ammoniating Solution, Chlorine, Anhydrous Ammonia, Sulfur Dioxide, Butadiene, Refrigerant or Dispersant Gases, Nitrosyl Chloride, Helium Hydrogen Oxygen, Nitrogen Fertilizer Solution, Ethyl Chloride. The “Mesa Refinery Watch Group” is going to be real busy in the near future, and the local printers in our area will be booming by making stacks of yard signs to address these additional safety concerns! It would help if you could indicate which planning commissioners represent which districts.